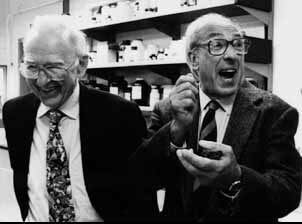 Edwin Krebs and Edmond Fischer, Nobel Laureates for discovering the regulatory role of protein phosphorylation. Fundamental studies of the regulation of glycogen metabolism by Professors Edwin Krebs and Edmond Fischer in the 1950s revealed the role of phosphorylation in the control of many cellular events. This scientific partnership continued for over 40 years, and served the department and university as a model of collegiality. The pioneering discoveries of Krebs and Fischer were recognized by the 1992 Nobel Prize for Physiology or Medicine. From iBiology, this delightful video featuring Edmond Fischer details his work fun and partnership with Edwin Krebs and the story of their discovery of reversible protein phosphorylation. Martin Rodbell earned his PhD in 1954 from our department and went on to a distinguished career at the NIH, where he played a central role in the early days of signal transduction research. He has received many international awards, including the 1994 Nobel Prize for Physiology or Medicine. He was awarded the honorary title of “Alumnus Summa Laude Dignatus” by the University of Washington on June 6, 1996.